Once you get your hands on this pod mod, you will realize that vaping just got a whole lot easier. You might also feel like these pod systems are getting more creative. Well, if the product is coming from OVNS, then you should already know that the team behind it is pretty crafty. 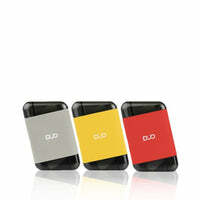 They are introducing us to the Duo 7.2W Pod System Kit that many are saying is changing the game when it comes to vape. This system will be slender and compact so that it can easily fit in your pocket. Nothing is going to be bulging out of your pocket when you take this kit along with you. The mod will have an integrated rechargeable battery capacity of 400mAh. With this much power, you will have a good time going on several trips before you have to start searching for an outlet. The mod will also have a maximum wattage output of 7.2W, a voltage output range of 3.3V to 4.2V, and a coil resistance of 2.0ohm. When it comes to a pod capacity, there will be a maximum of 4ml. However, there are technically two different pods, one on the bottom and one at the top. This means you can enjoy two different flavors when vaping with this pod mod. Working with this kit might be the start of a new friendship.